When you are preparing to enter the job market, you must have one very powerful tool in your arsenal—a resume. Your resume is your representative in the market, the impression that many companies will get from you. This means it is crucial that you develop your resume to be the absolute best it can so that it is the most effective means of expressing yourself within the job market. The job-seeking world doesn’t consist of just one kind of resume. It is important that you develop a resume that will be compelling for the position that you desire. This means you must target it toward the responsibilities and skills of that particular position and the context of the company. Make sure that you are highlighting only applicable skills and experiences. Your value proposition statement should be approximately 3 to 4 sentences that review your focus as well as the strengths that you are bringing to the position. This is not the same as a personal objective statement. With your value proposition statement you are not making a statement about your desires and aspirations, but rather what you want for your potential employer to see in you and what you can offer if granted the opportunity to become a part of the company. This will be a critical element of your resume. You are not just creating a list of the places you went to school and the degrees you earned, but rather the skills and abilities that you have that will be a positive complement to the company. You want to show not just what it is that you do, but what happens when you take these skills and apply them to a position. You want to create a situation in which your employers can envision you in the position and helping them overcome the challenges and issues that they are currently facing. Putting carefully chosen keywords in your resume will make you more visible if you are listing your resume online. Companies often use scanners, similar to the internet spiders, to locate the resumes that contain specific keywords. This means that if you have a section on your resume called “core competencies” or “core skills” and fill this section with keywords, you will enable these companies to more easily find you. These keywords will also identify your strengths and capabilities so that the recruiter can quickly gain a strong picture of your abilities and the type of worker that you are. While this is not something that you put on your resume, it is important that you have two different versions of your resume. 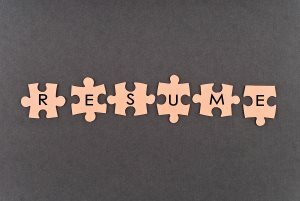 Having both a text version and a word version enables you to send a resume through to a recruiter knowing that it will remain in format, yet still be able to print one out or attach it to an email and it will remain clean.